Students are led in a singing and dancing exercise called harambee, which means “let’s all come together” in Swahili. 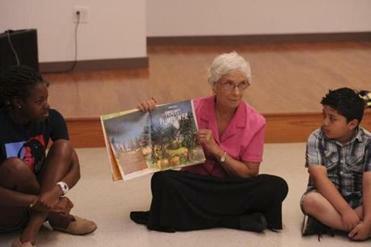 State Senator Patricia Jehlen, a Somerville Democrat, reads to a class. activities like making art, taking field trips, or hosting a local “read aloud guest” for a story and a question-and-answer session about their profession. Every morning at the Connexion Freedom School in Somerville, the students are greeted with an enthusiastic “Good morning!” chant before they start harambee, a ritual involving a loud motivational song and dance. Afterward, servant leader interns lead an integrated reading curriculum that blends books and cultural enrichment. Afternoons are available for activities like making art, taking field trips, or hosting a local “read aloud guest” for a story and a question-and-answer session about their profession. 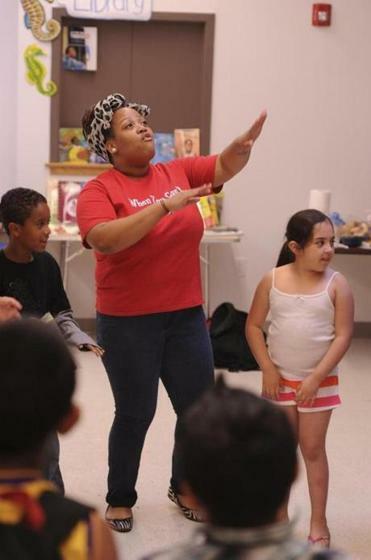 At the Somerville school, Breanya Hogue leads a class in an exercise called harambee. students’ reading ability, create positive attitudes toward learning, promote civic engagement, encourage healthy eating, and get families involved in the entire process. “We give a lot of praise, a lot of chants, a lot of cheers, a lot of motivation,” said Breanya Hogue, this year’s project director. 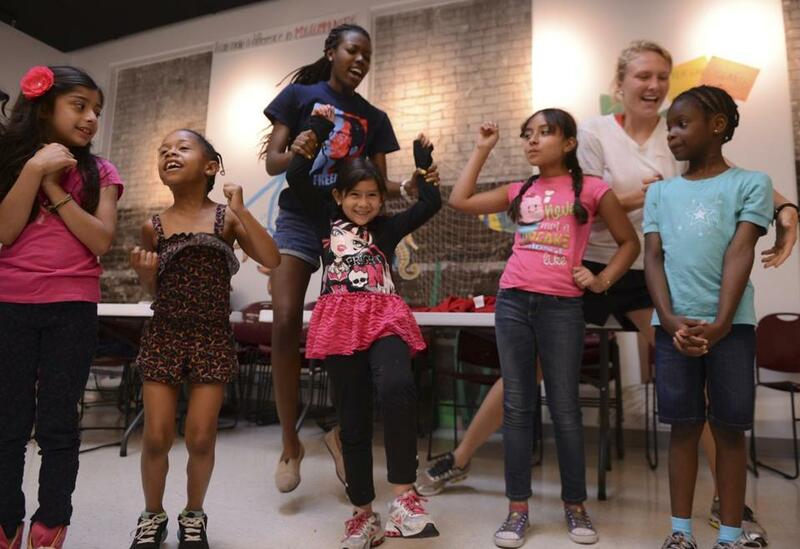 Somerville’s Freedom School, located at the Connexion building at 149 Broadway, is free for all participants, with funding provided by individual donations and a three-year grant from Arlington’s Calvary Church, United Methodist . The six-week program relies on volunteer aides and servant leader interns, college-age employees who attend a week of training in Tennessee to learn the national reading curriculum. Hildebrandt said he’s happy to provide free learning opportunities to students whose families may lack the means to send them to similar tuition-based summer education programs. Carolina Machado, whose 6-year-old daughter Hannah Julia attended Somerville’s program last summer, said she saw a distinct change in her child’s ability and confidence. “She really improved a lot in her reading and her talking,” said Machado of her daughter’s English skills. Machado is from Brazil and the family mostly speaks Portuguese at their Cambridge home. Hildebrandt said that shift in ability and self-esteem is typical of Freedom students, especially in terms of harambee. “The song is this really simple good morning song, but our staff is trained to sing it at the top of their lungs, as excited as they can,” he said, noting the students aren’t always on board right away, but tend to open up after the first week. Hildebrandt added that the music is positive reinforcement of Freedom School values. Hogue, who served as the top servant leader intern last year, said that Freedom School provides students both the motivation to learn and the tools to do it. In addition to the daily classes for children, the Connexion Freedom School also offers weekly workshops for parents to discuss children’s educational and social development. “Last year, it was great to hear the parents sharing their experiences and learning from each other as well,” said Hildebrandt. The program hosts three classes of up to 10 students — one group for kindergarten through second grade and two groups for third through fifth grade. There are still spots available for this summer. Hildebrandt hopes to create partnerships with other churches in nearby communities to eventually open up a second Freedom School location.